Home Education UK - Over 100 pages of support and advice for home educating families. Home Education in the UK - A home education website by a British Christian family currently living in Cyprus. HE-Special - Home educating children with special educational needs. Freedom in Education - A very interesting and enjoyable website written by a home educating family living in France. Home Education Advisory Service (HEAS) - Provides support and advice to home educating parents. This organisation has been reported to be quite undemocratic. 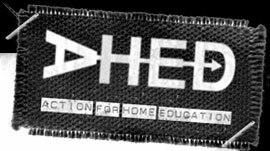 Action for Home Education (AHED) - An action group with a focus on the defence and advancement of home education rights and liberties and of fair and equal treatment for all home educators in England and Wales. Schoolhouse - Sister organisation to Action for Home Education for home educators in Scotland. HedNI - For home educating families in Northern Ireland. HESFES - An annual gathering of home educating families. HE-Exams-GCSEs_alternatives_others - Yahoo discussion group for home educating families who have children who wish to take GCSEs. It should be noted that Asperger Home Education has no association whatsoever with the organisation Education Otherwise!